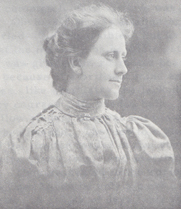 Stella Howard decided to become a medical missionary after hearing a missionary lecture on China when she was fifteen. She entered Boston University School of Medicine in 1896. In 1873 the Boston University School of Medicine had merged with the Boston Female Medical College and continued its commitment to educating women. By 1893 more than a third of the students were women. According to her son William, Stella was painfully “modest and shy” not at all how you would think of an early woman physician. To get to medical school she rode her horse from her parents’ farm in Dover to Wellesley where she kept her horse at a friend’s stable, then changed her clothes and took the train into Boston. Not an easy commute. At medical school Stella met and fell in love with a fellow student Clarence Crane. They married a few days after receiving their medical degrees in the spring of 1900. Stella gave up her dream of working in China and decided to devote her life to helping those closer to home. While working in dispensaries in the poorer areas during her training, Stella found that alcohol was the cause of much hardship. She all too frequently saw husbands who on payday drank up a week’s pay, come home drunk and beat their wives and children. There had been no drinking in Stella’s house and she abstained from drinking alcohol her entire life after seeing the suffering and violence that it could lead to. In 1961 Stella wrote, “I boarded at Dana Hall just one winter. The other four years I stayed at home travelling back and forth on horseback. I change my clothes at the Andrews place about half a mile from school. When the roads were icy, I walked or dog trotted when possible. We lived near the top of Pegan Hill, Dover, five miles away and oh! How cold it was those wintery mornings…going home was real fun. I could gallop up those hills. Miss Julia and Miss Sarah Eastman (my ideals!) used to give us literary gems to learn and I used to memorize them riding back and forth, 5 miles each way.” After Dana, Stella spent two years at Wellesley College, still commuting by horse. An additional note: Elizabeth Blackwell (1821-1910) was the first identified woman to graduate with a medical degree from the United States. She was admitted in 1847 to Geneva College of Medicine in Geneva, New York. She was interested in medical and social reform both in the United States and England. Elizabeth is the great-great aunt of Eric Goodson. Post, Winifred, The Eastmans, N.d., p.14, TS, Winifred Lowry Post Bibliographic File, Nina Heald Webber 1949 Archives, Dana Hall School, Wellesley, MA. Stella Spaulding Howard 1894 Biography, 1874-1967, DH2009-005. Nina Heald Webber 1949 Archives, Dana Hall School, Wellesley, MA. Winifred Lowry Post Bibliographic File. Nina Heald Webber 1949 Archives, Dana Hall School, Wellesley, MA.